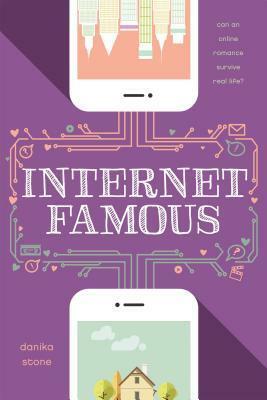 Internet Famous is Danika Stone’s second book with the Swoon Reads line. I haven’t actually read her first novel with them, All the Feels, yet, but I still was excited to get a hold of a copy of Internet Famous! Madi is Internet Famous thanks to her Madlibs blog, which has massive following. She loves the escape her online world provides from the problems in her real life, such as dealing with the fallout of her absent mother and helping out her sister. However, her blog has attracted a troll who just won’t leave her alone. At first his comments just seem to be cruel, but things get serious when he starts hacking her website, reporting her to her school for plagiarism, and doxing her. One bright side to all of this drama is Laurent, who has been a calming force for Madi. Laurent is right there for Madi as she tries to get everything under control. An exchange student from France, Laurent is such a sweetheart. He is a geek just like Madi, and they really are perfect together. Each chapter includes text message bubbles, tumblr posts, or snapchat photos. These were such a fun and fitting additions, and I loved whenever I would come across the next set of messages. Overall, Internet Famous is a fun read while still tackling more serious subjects such as online bullying and doxing. I recommend this for younger teens looking for a cute contemporary read, especially if they love online fandoms. Danika Stone is an author, artist, and educator who discovered a passion for writing fiction while in the throes of her Masters thesis. A self-declared bibliophile, Danika now writes novels for both teens (All the Feels and Internet Famous) and adults (Edge of Wild and Intaglio). When not writing, Danika can be found hiking in the Rockies, planning grand adventures, and spending far too much time online. She lives with her husband, three sons, and a houseful of imaginary characters in a windy corner of Alberta, Canada. Thanks! I hope you enjoy it if you decide to read it! I’m excited to read this books, especially since I’ve heard overall pretty great things about it. Thanks for a great review! The inclusion of the tumblr posts & snapchats really did make it a fun read!